Monday, February 4 is Bus to Work Day in DC. In harmony with Transit Equity Day, Bus to Work Day celebrates those who commute by bus and it encourages others to try it. Increased bus ridership in-turn improves traffic congestion, air quality, road safety and opportunity for all. In tandem, Monday is designated as Rosa Parks Day in honor of her lifetime commitment to civil rights. 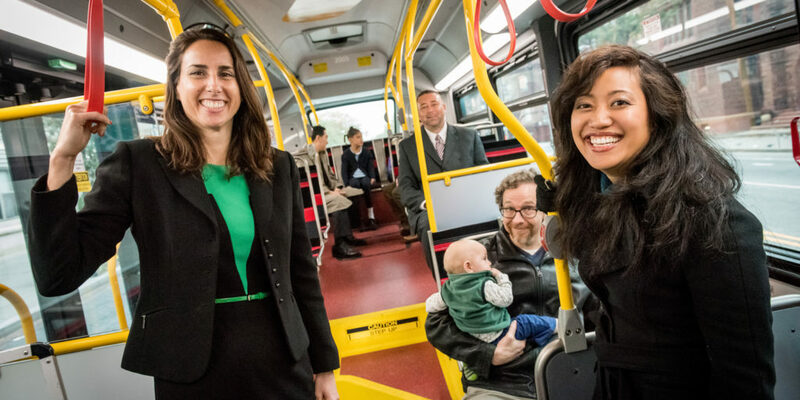 The inaugural Bus To Work Day DC arrives during the first week of #FairShotFebruary, Mayor Bowser’s initiative that offers FREE DC Circulator rides during the entire month of February. Ready to try a ride? Our interactive map can help in planning your Circulator trip for Bus To Work Day and beyond. Learn more about Circulator Bus to Work Day promotions by connecting with us on Twitter and Facebook. Use the time usually spent driving to gear up for a big day or decompress after a long one. Use our free onboard Wi-Fi to catch up on email, read, study, post and more while your bus operator navigates the roads for you. Have someone else chauffeur you back and forth as you relax and unwind. USB ports in every seat make it eas ti Charge up for the day or recharge after hours. Riding the bus provides above-ground sun and scenery often unavailable with rail transit. See the city through the large windows or watch the sunset after a late work day. Commuting by bus reduces expenses typical of car ownership including, gas, insurance and more. Save even more this month with FREE rides across all routes at all times during the month of February.